They say that the secret of a good blog is regular and consistent posting. Clearly this blog is heading south. I can't believe its been a month since I last posted. I got home from my trip and suddenly..... things became very busy, very quickly. My parents suddenly decided that they wanted to move States to somewhere warmer and they wanted to do it before Christmas. So, I have been on this manic exercise to help them do just that and get their home of 25 years ready for market. I think I have spent most of my time trying to convince them, without insulting them, that we needed to throw out things, declutter and then style it to suit a younger market. I think I would rather walk on hot coals then tread that awkward negotiation path again and I pray I remember this experience when I gain a few more years. We had a huge garage sale and then we just finished interviewing real estate agents last week. After talking to these salespeople and going round and round in circles and still not understanding the whole value adding scenario they were describing, I decided I would sell it myself (apologies to anyone in the industry). So I have been playing removalist, decorator, negotiator, throwerouter, cleaner, photographer and now real estate salesperson. I put the For Sale ad up this morning on one real estate site and within 30 minutes I started to get calls. Err, yikes....I had to quickly put on the real estate sales hat. Hopefully things will now be a little less crazy. Take Friday for example, I went online to order groceries and ended up with 64 green apples. I ordered 8 apples....and got 8 packets of 8 apples. So, I now have a huge bowl of green apples sitting in the Kitchen of my parent's house as a design feature....for the first open house. I hope that I'm wearing that same smug expression in the next couple of weeks too if this house gets sold. If not, I will be crawling back to one of those agents. Oh yeah, and before I forget, if you want an exceptionally well presented 4 bedroom home with an amazing garden and a bountiful bowl of green apples thrown in for good measure, you know who to call......because have I got a deal for you!!!! Yes just for you. I am so happy you're back, Lilly! I'm also in awe of your energy in trying to sell your parents' house on your own. If anyone can do it, you can. It looks quite modern enough now that they've redecorated so I know what you went through. You know, Lilly, one normally hears about children moving away to different States, and parents feeling the nest emptying, even if it is a bit away from them. But here it is the parents wanting to move ! Why would Des and your Mom want to move away ? Will there be any family where they plan to move ? Is this the children-in-the-nest-waving-to moving-parents syndrome ? @ Kay - mmm not sure how much energy I have but I just cannot tolerate the amount of commission you have to pay on homes. I may change my mind on that decision but I hope not. Its such a big move and you certainly must have felt it too but it is kind of nice to know that at least your old home is still in the family. And its inevitable that someone wants to change it - there are only young couples who are interested in my parents one so far so we have had to change it up a bit to get them interested. @ Ugich - that is funny but so true. In fact when I moved to the UK a while ago my daughter asked me the same thing. "Arent the kids meant to leave home not the parents?" No, I am going to be moving down south to be nearer my daughter soon and so my parents are moving up to warmer weather where three of my siblings live. And my younger sister, (with the very large house) has enought room for them to stay for some time while they are looking for a new house. That is, provided I can sell this one of course. Des is finding it very tough I have to say but the house is getting too much for them as it has a very big yard. Hope you are well and oh boy do I have some blog reading to catch up on too. Lilly, now that you've explained, it sounds like a sensible thing to do, and I am so glad your other siblings will be close by for Des and your Mom, now that you plan to leave the area too. When my parents residential area got very noisy and full of traffic, I used to beg them to move, to a place I had in a quieter area, but they always refused, because they had so many friends and a lifetime involved in that area, right from their old friends, the vegetable person, the electrician, their doctor, the groceries chap, etc. And so I actually admire Des and your Mom for planning such a move ! Lilly, I'm sure you'll do a good job selling the house on your own, you're so talented. Great to hear from you! You live in the UK now?!! Did I miss something? I thought you were still in Australia. I think it´s great that you are selling your parents house. I´m sure you can do it! I wish I could come for an "Open house" : ). I´m so happy to see you blogging again. I missed you! Its always a pleasure to have your wit and charm drop in on us once in awhile! Am walking this same road with you though ultimately am going to rent the house, and decided not to sell. Trying to convince mom to pare down as we sort through all of dad's things and have no earthly idea what half of it is or its value. In the end you'll be glad you did this when you chose to, instead of waiting till you have to. Wishing you all the best on this journey! Getting ready to sell a house is an enormous task with all that is involved. Now, if it is priced correctly, it should sell within 30 days quite easily. Houses sell themselves if the price is right. If the price is too high, the market refects that by your not getting offers. It is very cut and dried from an economic sense. Hope your parents find a wonderful new home to enjoy the upcoming holiday season. 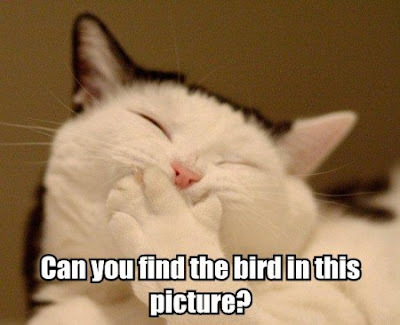 The cat picture cracked me up - very cute & funny! Hi Lilly, Great to hear from you. You sure have your hands full but I wish you great luck and success in selling the house. It's a big job. And I hope your folks transition well with all the changes. 25 years in one place is a long time. I've never ordered groceries online but thanks for the tip about the apples. I'll be sure not to make the same mistake... or I'll be making apple sauce with all the extras. Hang in there and keep us posted on your progress. Who knows, it could be the start of a new career for you! Hang in there - and good luck with selling the house! We went the DIY route selling our first place, it wasn't too difficult 20 years ago but buyers are now a lot more knowledgeable , not to mention fussy! Glad you came back to give us an update. Good luck with the house! Lilly darling, missed you....when ARE we going to meet? :)) Have been offline so much myself; glad I'm not the only one....! Lilly, Lilly! Nice to have you back where you belong .... I traveled the month of October, feels good to be home. I managed to keep up (begging, borrowing computers) with weekly poetry on Poetry Matters, keeping me somewhat in a loop. I sold my home in Florida prior to moving west five+ years ago. A few headaches along the way, ended up paying the buyer's agent a 3% commission but well worth it. Hang in there darlin' ... it may take time, but you can do it! Me too, girl! I have been so busy with life, golf, digi classes and standard daily BS that I have not been posting regularly. I hope that you survive the move, sale, decorating and all. It is a lotta work. And it must be kinda sad to move after 25 years of living there. Good luck selling the house!!! I suggest that every buyer that comes through gets an apple. I can't imagine selling a house. I've been in mine for so long. Oh My, Lilly...YOU have been busy, busy, busy, and with huge undertakings...And now, Miss Real Estate Lady, as well.....I hope the house sells quickly and easily my dear. I miss your posts and your visits. Take good care and much lick with the House Sale! LOVE that you have this great display of Apples...Maybe you can give each of the propective buyers one of those Green Goodies! Keep up the good work! Oh and bloody write more often - there is no inspiration for me without you! Thanks for your somments all you very special people. And I hope I have lots of time soon to start reading all your blogs again!! And you are right af1blog, I should bloody write more and I want to. Sometime soon - I have missed your writing too!! The price? cheap at half the price for anyone with British pounds!!! You're doing a sterling job in sorting the house out what a job to take on though. How is the housing market there - hope it's a hellova lot better than here ! Everything is going to Hell in a handbasket - house prices are dropping and buyers are as rare as hen's teeth! But Good on yer !! (my that does sound Aussie doesn't it ?? Must be because of my associating with these folk on the upside down part of the world . By the by, did ya hear that the person who should be ruling over 'us' is a man called Mr. Michael Hastings - would you believe he has lived, married and raised a family in Oz since the 1960's in a place called Jerilderee (I think). My blog entry yesterday explains it.. Anyhoo ! What do ya think of that huh ?? Would that Princess Di were here to hear of it hehehehe.. She would be laughing herself stupid at the thought of all these courtiers and 'High heid yins' cutting her off at the knees ! God this is turning into an epic!